Customized Ribbon and QAT is very common. I believe all serious Excel users will have their own customized Ribbon and QAT according to their own working habits. Then select the path you want to save the file. Once it’s done, you should see the following file in your destination folder. Note: This will replace your existing QAT and Ribbon customizations, if any. 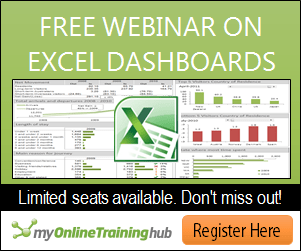 Want to learn Excel Dashboard but didn’t know where to start? Don’t miss the FREE webinar to be hold by MYNDA TREACY of myonlinetraininghub. In the webinar, Mynda will show you the fact that building an Excel Dashboard is actually easier than what you may have thought about. This entry was posted in Excel Tips and tagged QAT, RIBBON. Bookmark the permalink. How to excel 7 customise Ribbon? & coppy past hide?